One of his most famous achievements was at the outbreak of the Second Punic War, when he marched an army, which included war elephants, from Iberia over the Pyrenees and the Alps into northern Italy. The word Punic is a form of the word “Phoenician”, which was a land in the Eastern part of the Mediterranean, covering the modern territory of Syria, Lebanon and Northern Israel. In his first few years in Italy, he won three dramatic victories, Trebia, Trasimene, and Cannae, and won over several Roman allies. Hannibal occupied much of Italy for 15 years, but a Roman counter-invasion of North Africa forced Hannibal to return to Carthage, where he was decisively defeated by Scipio Africanus at the Battle of Zama. Scipio studied Hannibal’s tactics and brilliantly devised some of his own, and finally defeated Rome’s nemesis at Zama having previously driven Hasdrubal, Hannibal’s brother, out of Spain. Wikipedia also informs us that Hannibal’s military exploits continue to be studied in military academies all over the world. Someone at a tourist office in Tunisia told me that Hannibal is the historical figure of whom Tunisians are most proud. 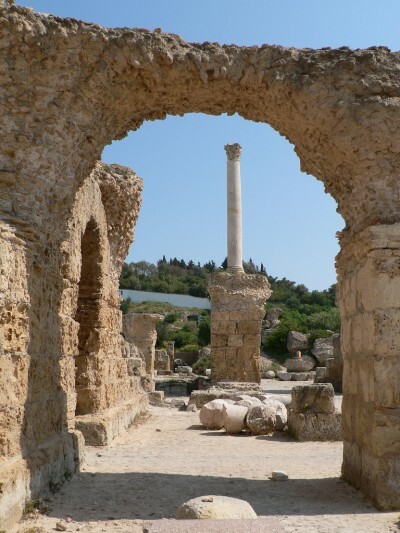 The photo above of ruins in Carthage, Tunisia, is by johnmuk, and I have reproduced it here under a creative commons licence. Yes, but Hannibal’s continuation of one war after another led to the complete destruction of Carthage, Rome ensuring that it would never rise again. Do they study that? I guess that if he had left Rome (I mean the countryside around Rome, now known as Italy), and not continued this 15 year war of attrition, the Romans might have come over and flattened Carthage earlier. But yes, it seems that whereas he wasn’t able to siege Rome and conquer the city the Romans were (eventually) able to do that to him.